The loop is supposed to sense a bicycle in the lane waiting for a red light and sets the light up to change to green. That is opposed to the post with the push button (which you can see on the cyclist’s right), which is supposed to basically do the same thing, assuming you push the button, of course. So we put it to you: All things being equal, which do you prefer? Poll is in the sidebar. We’ll leave it there for a while. So there you have it. The loops win. I may be loopy but I’m not a loop fan. The loops on my route are for motor vehicles only. Give me a button anytime. Is Larsen a bike person or a bike observer? The poles set you in a bad position in the roadway- off to the side where you are less visible and less predictable. They put you in a prime spot for a right-hook from a motorist. Cyclists should stay out in the middle of the bike lane where they are visible and clearly showing intent to travel straight through the intersection. If Oregon didn’t have a ‘mandatory bike lane’ law I would even say they should be out of the bike lane in the middle of the lane- allowing right turns to the right of them and increasing visibility even more. Since we do have that law and a solid stripe all the way to the intersection we should definitely not be ‘hiding’ among the sidewalk furniture over on the edge of the roadway looking like we might be stopped for a break, turning right, or panhandling. A classic horrible spot where the pole sets you up in the WORST possible location is on Pearl and 19th. The pole is on the left hand side of the road, you’re turning left with motorists to your right. When you turn left you want to be on the right side of the road (in the bike lane) and most likely are headed for the Amazon Path. That intersection needs to be redone so the bike lane (and inductive loop) is in the MIDDLE of the left turning car lane and straight/right turning car lane. That set’s you up to be in the bike lane rather than crossing paths with the left turning motorist. PS- cyclists- Stop for pedestrians in that crosswalk (and ALL crosswalks)! I don’t know the intersection in question and I’m not following this. The law allows you to just take the motor vehicle lane if you’re making a left hand turn, correct? If the loop doesn’t trigger the lights after a full cycle, I believe you’re also allowed by law to proceed though the intersection with caution. Not to be rude, but buttons are stupid. They don’t know if you’re still in the intersection or if you’ve cleared it, and they can’t sense another cyclist coming behind you. Not to mention that if the first person in the lineup doesn’t hit one, you never get a signal. Why put more burden on cyclists when autos have loops? Car drivers don’t have to reach out and hit a button. If you want to push a little button, then walk your bike on the sidewalk. Otherwise, be a vehicle and assert your right to be treated accordingly. I don’t mind well place buttons – those that are placed specifically for cyclists. But I prefer loops or sensors. I understand the desire to not un-clip and hold onto the button post. What makes sense to me is a combination of both, plus a railing along the edge of the road leading up to the intersection that would allow several cyclists to hang on without un-clipping (see: http://farm5.static.flickr.com/4093/4769035634_6ca2a2d7f8.jpg). 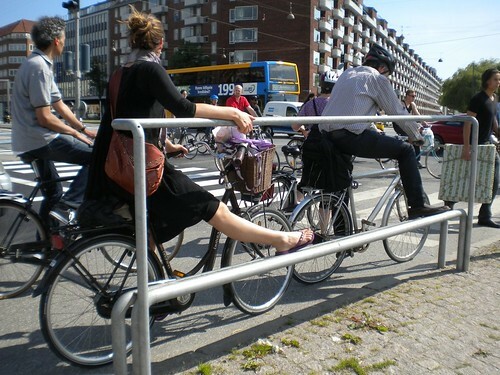 This is a feature in more advanced cycling cities like Copenhagen and Amsterdam, etc. Might it be that the issue between loops and buttons is really about finding a solution that works for most, but is also the least expensive? I’m all for saving money, but we could use a lot more cycling infrastructure. We’ve got a decent cycling city, but we could be better. I’m with Shane on this one. Give me a loop for good lane positioning. I’ve already been left-hooked, no need to add right-hook to the list. Has anyone else noticed that the intersection pictured in this post (6th and High), can change on a dime? I had a close call the other day with it quickly switching to yellow and then red as I was approaching at a good clip, under the assumption that it would remain green. I then hung out at the intersection to observe how quickly it turned; it was ridiculously fast. Watch out with that one. Shane’s right about 19th and Pearl (I know it well), however I never use the button. I also do not use that pathetic little strip of so-called bike lane to the right of the left-turn lane (heading south here, folks). There is usually enough traffic to trip the auto sensors, and I take the lane when turning left–big, ugly and obnoxious, I am clearly visible to all, and if drivers don’t like it they can sit on a tack. Hmm. Voter participation not so good, compared to page views. Ah well. Thank’s to all who did vote and comment. Shane makes good points. I also agree that 19th and Pearl is awkward on a bike. Seems to me it’s an unusual case, what with Pearl being a one-way street, and lots of cyclists headed to the Amazon path — or perhaps to the high school. Would a bike box would help here? So a cyclist heading down the bike lane on Pearl (there are bike lanes on both side of the street there, correct?) can easily get in front of traffic at the light in order to turn left — and then safely, we hope, get to the right side of 19th and be able to then turn right onto Amazon path. Or is a bike box just a Band-Aid solution? I think a bike box there could certainly help. Though I think a better design would be to bring the bike lane into the middle of the lanes so you’re set up in the right spot (right now there is a little painted space you can use as that de-facto area). A good way to get to that middle bike lane would be to have a bike box at 18th and place the bike lane right after the 18th intersection leading up to 19th. Then maybe have a “Sharrow” (no not her, the one painted on the pavement) between 18th & 19th as well (in the left most car lane). Many cars in that left lane turn at 18th so you don’t have a lot of conflicts between 18th & 19th so you have a “shared lane”, a bike lane, the busy straight/right car lane, and the curb side bike lane (for cyclists using Amazon Parkway). It’s certainly a special case but there are plenty of other locations where the buttons are dangerous for right hooks. ← How much is that fixie in the window?